It's approximately four months after my 40th birthday, and there's something I have got to admit to myself. I am uncool. I am an aging Gen-Xer, and very proud of that, but my coolness has waned considerably. I shake my head at the youths who come into my job, I squeal at the sight of puppies and babies, I listen to Gen-X music, which is now on the classic rock station. I am uncool. Just ask the tween I am in close proximity to. I get eye rolls just like her parents do, and you don't roll your eyes at a cool person. It's sobering, realizing that my "cool" days are past me. I want to shout "You kids have no idea what growing up without the internet was like! You've never made a mix tape! You don't remember when it was possible to pay for gas with change! Get off my lawn!" Ahem. But I digress. 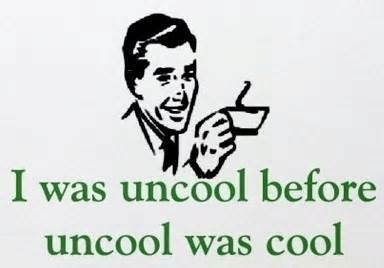 Being uncool really used to bother me. I work with people that are mostly younger than I am, and I distinctly recall a moment when Jesus Jones's "Right Here Right Now" which was a radio staple in 1992, came over the loudspeaker. A co-worker (YOUTH!) looked at me questionably when I started singing along, and I raised an eyebrow as she said "Oh, is this an oldie?" I assure you I did not cause her bodily harm, but if looks could kill, well, you know. An oldie. Me, singing along to an oldie. Inconceivable! I mean, I still think of the 90s as ten years ago, which is shady math at best, but no, it is not ten years ago, as much as I wish it was. Darn math. So I'm uncool. I listen to OLD music, I like OLD movies (The Small and Tiny ones whine about watching "The Princess Bride!" INCONCEIVABLE, I say again!) Even my tattoos and piercings are older than the teenagers I interact with at work. How did I, who once almost broke her back at a Black Sabbath concert, become uncool? The answer, sadly, is very clear. I stopped following popular culture. Mired in my 80s and 90s roots, I didn't grow as the culture did. I prefer retro stuff, OLD stuff. I've never watched a Netflix series. I have not a single clue as to who is popular on the radio, or if anyone under the age of 40 even listens to the radio any more. I don't know who's the current dreamboat unless they have gray hair. I don't play video games, I don't have Snapchat. To me, that's for The Kids, and I am definitely not A Kid. 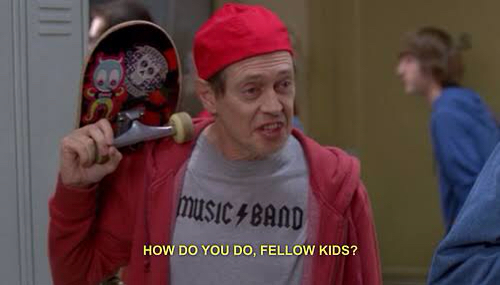 So the kids, they will never see me as cool, because I am old enough to be their parent. And you know what? That's okay. If I tried to be like them, I still wouldn't be cool. Because I am An Old, and trying to be like them would be laughable at best, and creepy at worst. The tween in the house will never think I'm cool, but she might think that I'm okay for an old person, and that's exactly how it should be. So I've come to accept my uncoolness. I will remember being cool, and the 90s, fondly, but I will not for a single second think that I'll ever get that time back. I can be a pretty okay Old, and frankly, that's fine by me.